British pop star Rick Astley joins Larry to discuss the surprise success of his new album '50,' his personal experience with "Rick-rolling," and the response to President Trump across the pond. Plus, rocker Eddie Money looks back at his legendary career and talks what's next. Larry King is joined by two 80s music icons promoting their headlining roles in the iHeart80s parts, coming January 28th. First, Larry meets Rick Astley the “Never Gonna Give You Up” singer who faced a career resurgence when his single became the subject of the internet sensation Rickrolling. The singer, who recently released a new album “50,” speaks to his early days as a musician, and how it felt to be a viral meme. Later, the British musician relays to Larry how Donald Trump is viewed abroad, and his hopes for the US’ political future. Then, Astley reflects on a plagiarism controversy involving the new President, when he discusses the possibility of his lyrics being used unattributed by the First Lady’s speech at the RNC. 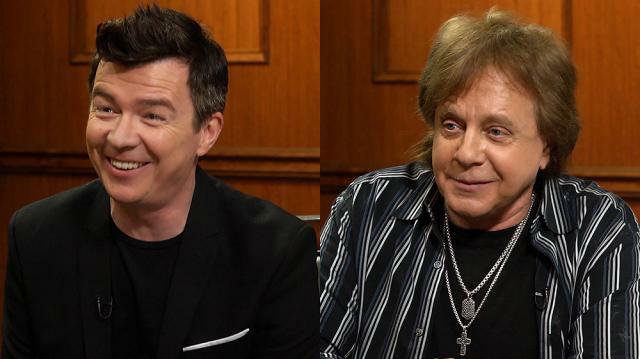 Next, Larry King sits with “Take Me Home Tonight” rocker Eddie Money. Money details his journey to sobriety, and the change that has made with him and his family. He also speaks to streaming services and the impact they have on the music industry, as well as his deep love for touring.